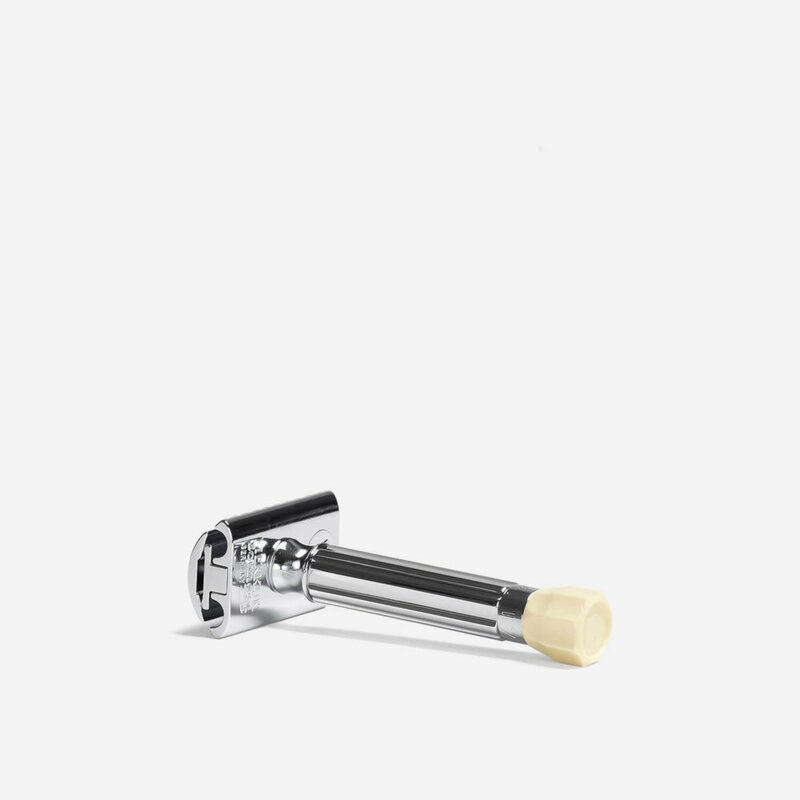 Adjustable DE safety razor with a polished chrome finish. Earn up to 45 Reward Points for this item. The Merkur Progress is a fully adjustable DE safety razor which allows you to adjust the blade gap and therefore tailor the razor to your beard and skin type. Simply twist the adjustment knob at the base of the handle to adjust the razor. The adjustability makes the razor suitable for both novice* and experienced DE safety razor users. *For novice or first-time DE safety razor users, we recommend setting the razor at its mildest setting, ‘1’, for the first few shaves. Great shaver and usual excellent service from Sshave Lounge. The machine is definitely worth the money that he asked for. I recommend to both novice and experienced users. By the way is now very good price for it in the store, I recommend to buy. I have used this razor with a number of different blades dialing in settings between 1-3. This enables an ideal balance between comfort and closeness. Weight, balance and grip I seem fine and build quality cannot be faulted. Highly recommendable. A great quality item. What with the modern disposable lifestyles we lead now,it’s nice to have a piece of kit that’ll outlive you. It shaves well enough but the handle is so slippery that I get cramp within seconds trying to grip it. I do have large hands but the design is not conducive to ease of use, a case of design over function. I have only used this DE razor so can’t compare it with others, but it’s simple to load/ unload and adjust. The adjustment knob is at the safe end of the handle which is a useful feature. I think that the handle doesn’t want to be any shorter; it’s quite slippery to hold and top heavy so you need to find a comfortable secure grip. Excellent razor had one of my best shaves ever 2nd time of using! An excellent razor to say the least! It is very sturdy and one of the best shaves that I have ever had. I tried it with Murkur, Wilkinson Sword and Gillette blades, and I think that the Murkur blade was superior by a long stretch. When I used this combo along with a good pre shave oil and shaving soap, I did not cut myself even once. I would recommend this purchase without hesitation. Having had the Merkur Progress for several months, I get great shaves every time using Wilkinson or Gillette Yellow blades. In fact, I recently bought another one for my son and he said it is the best present I have ever given him. I recommend both the razor, and the great service from Shave Lounge. Excellent service, and a free 5 blade pack, and a few more thrown in to try. A great 3 pass shave with a Merkur blade, solid and easy to clean, my only gripe is the tiny line on the head is not easy to see so if you place the blade in it doesn’t zero in on (0) if its not lined up with the arrow below. I find set at 1 is too mild personally, on 3 at the moment and ok with that. Build quality of the Merkur Progress is poor compared to my Edwin Jagger 89L. Whilst the plastic knob initially looks cheap, it matches my faux ivory badger brush and stand quite nicely. I do not rate Merkur blades for my personal use. However, when paired with a Wilkinson Sword blade, the Merkur provides a creditable 3 pass BSS shave using settings between 1 plus and 3 on this particular razor (I understand calibration varies between individual Progress razors). For flexibility of settings and price, I would generally recommend this razor, and give it 4 stars. Service and price from Shave Lounge was good, and I would use them again. Gave this 4 out of 5 because nothing is perfect however this razor comes close. Lovely weight and feel, complimented by the ability to adjust the blade to suit your growth/ preference. Also looks great. As a recent convert back to D/E shaving this is an excellent razor for my 65 year old face which allows you to adjust the setting from an easy shave to a more aggressive setting to suit your skin and beard and area of face being shaved. I found this razor easy to use and very forgiving. This is the razor that I purchased after I outgrew my first razor which was a 23C. The Merkur Progress razor has very good weight and is easy to manoeuvre around the tricky areas. Have tried the Merkur 1904 (also bought from Shave Lounge), which is also very good but does not have the adjustment facility. (The 1904 can act as a very good travel razor). My Progress suffered from scratches on the platiing but this was replaced without fuss from Shave Lounge. The product itself is very good. On a side note, Shave Lounge gives outstanding service and I would recommend him as a excellent seller to do business with, I definitely would buy from Shave Lounge again. All in all, a very satisfied customer. This has been my razor of choice for over a year now. Very nicely weighted, easy to manoeuvre and gives an extremely close shave. Slightly prefer this to the Futur, which I also own, but I must admit the Futur looks slightly cooler in the looks department!